Foreign trade, opening-up policy nurtured to reach new heights, Song Mengxing reports. One of China's first coastal provinces that carried out the opening-up policy, Shandong has always held an open and win-win attitude to welcome friends worldwide in the past four decades, local officials said. It has established 457 foreign sister city relationships and friendly partnerships and expanded its foreign communication and cooperation in the fields of politics, economy, culture, education, technology and sports. The province in East China has seen year-on-year increase of its foreign trade. Its cargo imports and exports reached 1.78 trillion yuan ($259.47 billion) in 2017, 1,215 times of the amount in 1978. Foreign investment has become an important part of the province's economy. Its foreign capital actually used in 2017, according to the National Bureau of Statistics, was 121.05 billion yuan. The province has also actively integrated into the Belt and Road Initiative in recent years. Local officials said that regions involved in the initiative have become hot investment destinations for Shandong's businesses. It invested 10.06 billion yuan in countries involved in the initiative last year. Nine cities in Shandong offer train services connecting Asia to Europe. Among the 20 overseas economic and trade cooperative areas recognized by the ministries of commerce and finance, four are backed by Shandong's businesses and the four are all in countries involved in the initiative. Development of the areas will become important platforms for Shandong's cooperation with regions involved in the initiative, local officials said. Cooperation between Shandong-based companies and other regions taking part in the initiative is mainly in sectors such as rubber tires, textile and garment, mechanical equipment and electric appliances. The 18th Shanghai Cooperation Organization Summit was held in Qingdao, Shandong, in June. More than 2,000 foreign guests registered to attend the event and more than 3,000 domestic and foreign reporters covered the event, Xinhua News Agency reported. Shandong has had closer cooperation with SCO members in recent years. Its exports and imports with them amounted to 118.6 billion yuan last year and the province used capital from the members worth 1.25 billion yuan, mainly from Russia and India. Shandong's imports and exports with SCO members reached 28.72 billion yuan in the first quarter of 2018 and invested 30 million yuan in the members. Shandong has promoted several cooperation projects via overseas economic and trade cooperation areas. The province's home appliances giant Haier and a Pakistan company built an economic zone in Pakistan, China's first national-level overseas economic and trade cooperation zone. The zone has attracted investment worth $110 million and seven companies offered more than 3,000 jobs locally. She Chunming, head at Shandong's commerce department, said that trade cooperation between the province and SCO countries deepened mainly because bilateral economy became more complementary. Russia and five countries in Central Asia are the main production areas of world's oil and gas resources while Shandong has an increasing need for energy commodities such as crude oil and natural gas and become an important sales market for the goods. Energy cooperation has become an important factor to promote trade partnerships between Shandong and SCO members, local officials said. Fortune Global 500 companies are also an important factor for Shandong to increase its foreign trade. Zhang Weike, deputy head at Shandong's commerce department, said: "We stress to profoundly cooperate with Fortune Global 500 is not only attracting several projects and foreign investment. The more important aim is to bring in the world's most advanced concepts, technologies and management models." Shandong welcomed its first Fortune Global 500 friend, German group Henkel, in 1987 and since then 213 such friends have set up 726 businesses in the province by July this year. Their investment has been given to 17 cities in Shandong, promoting industries such as high-speed trains, ship building and information technology. The province plans to expedite its cooperation with Fortune Global 500 enterprises in the next three years, with each of its top 10 industries aiming to have 10 cooperation projects with the companies. 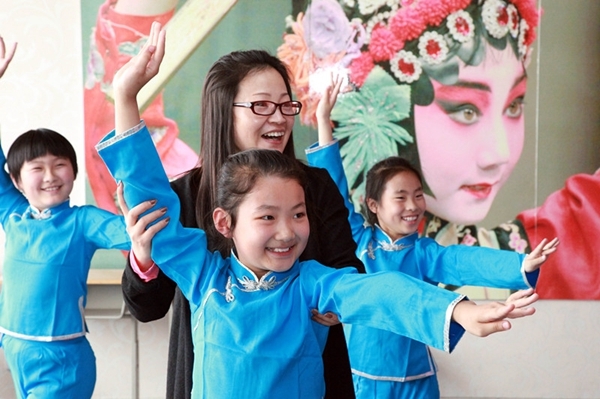 Wang Lingling, an inheritor of Lyu Opera, teaches students about the basic skills. 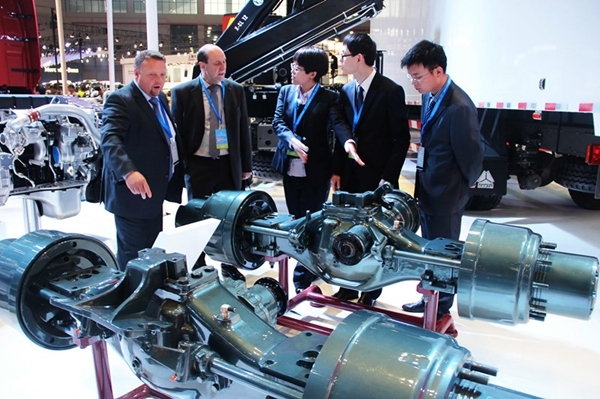 Axles produced by Sinotruk and Germany’s MAN attract visitors at an expo in Shandong. 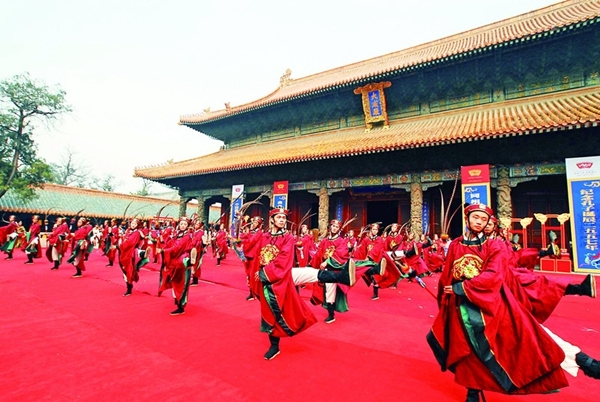 A memorial ceremony for Confucius was held in Jinan, Shandong province.